x 10-4 N. What is the electric field intensity at that point? the electric field intensity at point A? Q4. 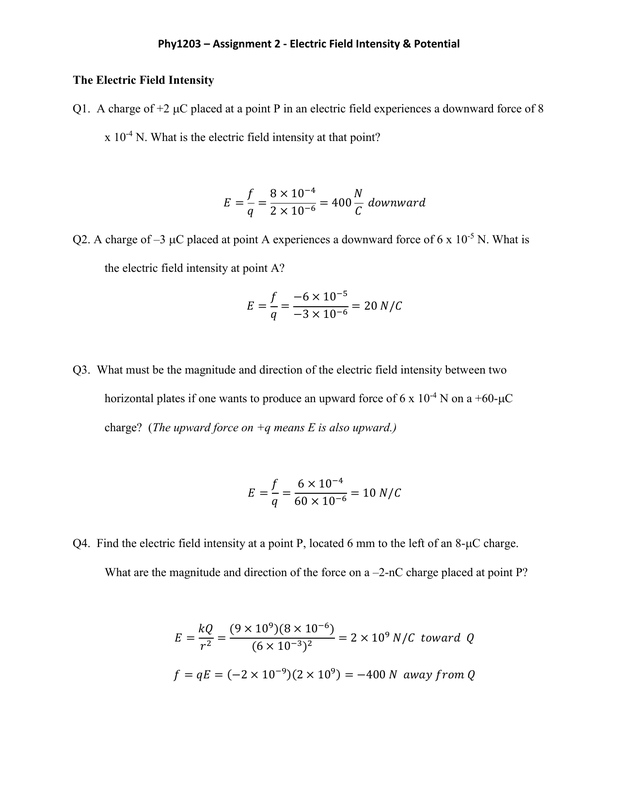 Find the electric field intensity at a point P, located 6 mm to the left of an 8-C charge. What are the magnitude and direction of the force on a –2-nC charge placed at point P? Q5. Determine the electric field intensity at a point P, located 4 cm above a –12-C charge. What are the magnitude and direction of the force on a +3-nC charge placed at point P? Electric field will be downward, since that is the direction a positive charge would move. charge with a +40-C charge. intensity at the midpoint of a line joining the two charges. the left of a 9-nC charge. potential energy of a 2 nC charge placed at that point? potential energy if a +3 C charge is placed at point A? located 80 mm away from the first charge? Q13. Point P is 0.42 m from a 0.02 C charge. i. What is the electric potential at point P? electric potential is 8 V. How much work is done by the electric field in moving the charge? shown. What is the electric potential at the corner of the square without a charge?